If you are 14 you can apply for a library card online. Apply now. Children under 14 who would like a card can visit the library with a parent or guardian, who will need to provide a picture ID and proof of current residence. We can produce custom-printed Braille cards using the library’s 3D printer. They are made of biodegradable plastic and measure 1.5-by-4-inches. 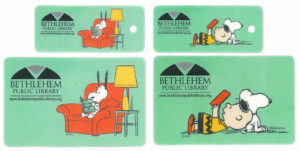 A Braille card is available to anyone eligible for a Bethlehem Public Library card. It provides access to the entire collection, including large-print books, audiobooks, eReaders and eBooks. Bring a photo I.D. and proof of current residence to the circulation desk; we can issue your card within a few days. If you already have a Bethlehem Public Library card, we can print a Braille version using your current library card number. Call 439-9314 for more information.